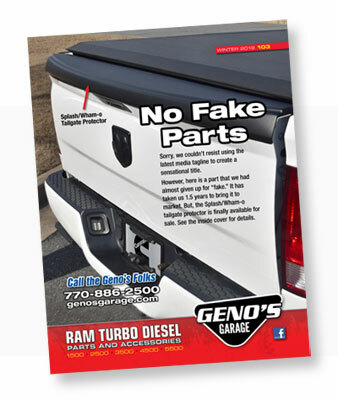 Check out our new Geno's Garage Catalog #103 - Winter 2019 online. Whether it's maintenance parts or accessories, have a look at what you need (want) for your '89-'18 Ram Turbo Diesel truck. - Splash Wham-O Tailgate Protector for '10-'18 Dodge Ram trucks. - MOPAR '03-'05 Dash tops. - ISSPRO EV2 mechanical fuel pressure gauges (0-30psi). - A limited number of '96-'02 Cummins Waco 2-piece vacuum pumps. You can also request a print catalog. Do you offer a forum discount code? Sorry for being late to the party here. We do not offer a forum discount code.